Of course, yesterday it was too warm for long sleeves, and even though there was apple pie and roasted squash, it was clear that fall has only been teasing us and has yet to be reliably here. In the midst of this fitful seasonal hot and cold, there are still odds and ends of summer to use up. And this is something you need to know how to make if you have a few odd tomatoes lying around waiting to be put to good use. It’s so easy it’s hardly even a recipe. It was invented by those thrifty Tuscans who were always looking for ways to use up old bread (their saltless pane Toscano seems to have left them with an overabundant supply of the stuff). Panzanella is the sort of dish everyone should have in their back pockets, ready to pull out and assemble in hungry moments. It sounds too simple to be so incredibly delicious. But it isn’t. Really. It’s another take on the familiar combination of tomatoes and starch so popular in spaghetti and pizza and bruschetta, and it can hold its own against any of them. When I made it for the first time about a year ago, I couldn’t believe I hadn’t been eating it forever. 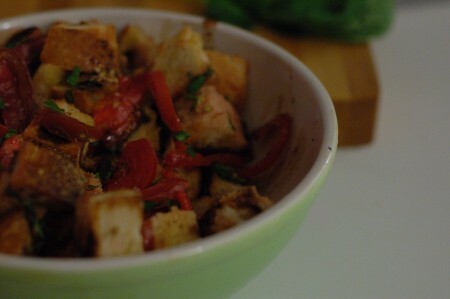 Just crusty bread, tomatoes, olive oil, balsamic vinegar, and basil. And some good salt and a few cracks of black pepper. And you have a dinner to devour. Really. This is a dish with so many variations. Some versions add slices of cucumbers or onions or olives, some use red wine vinegar instead of the balsamic I use here. The traditional method seems to be to soak pieces of day-old bread in water, but I prefer the depth of flavor and complex texture that toasted bread brings to the dish, especially since I usually make this with fresh bread that needs to be a little dried out to soak up the oil and vinegar and tomato juices. If I’m feeling decadent, I sometimes add some fresh mozzarella. Feel free to experiment, but do use a good artisan loaf of bread and the best tomatoes you can find. I’ve given rough amounts here for one person for a main dish, multiply as you see fit. 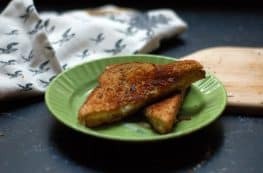 In a heavy-bottomed skillet over medium heat add a smidgen of olive oil (optional) and add the garlic clove and the bread cubes and toast until the bread gets golden on a few sides. Stir and toss the bread cubes and garlic occasionally and watch to be careful that they don’t burn. This should only take a few minutes. Add the bread and garlic to a medium bowl. Add the tomatoes and the olive oil and balsamic vinegar. Tear up the basil and add it to the bowl. Add a pinch of salt and a few good cracks of black pepper. Give everything a stir and let it sit for about 10-15 minutes. Give it a stir again. (You can pull out the garlic clove if you like. Its flavor should have rubbed off on everything.) And eat–either straight from the bowl or on a plate if you can wait that long.